LG G2 release date: when can you get it? It's got buttons on the back. What's not to love? The LG G2 wasn't exactly a surprise when it launched earlier this week with pretty much every aspect of the 5.2-inch smartphone leaked ahead of the New York event, but there was one piece of good news to come out of it - a global release. 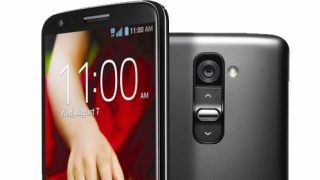 Following on from the LG Optimus G and Optimus G Pro, the G2 bucks the trend of its predecessors with an international launch which will see it arrive in more than just a handful for Asia-based markets. And the UK is one of those countries which has been given LG's blessing for its latest flagship - and one that looks set to give the likes of the HTC One, Samsung Galaxy S4 and Sony Xperia Z a run for their money. We've been knocking on the doors of the major networks and retailers in the UK to find out when and where you'll be able to pick up the LG G2, and we'll be constantly updating this article as we hear more. O2 has already confirmed that it will be stocking the handset "later this year", with the LG G2 release date currently pegged for October. Three joined O2 early on to confirm that the LG G2 was "coming soon", although it didn't offer us any information on price or an exact release date. There's no word from EE, the UK's only 4G network, but it's worth noting that the other main carriers will have their own LTE services up and running by the time the G2 arrives, so you'll likely be spoiled for super fast choice when it eventually does hit shelves. One of those carriers will be Vodafone which is launching its 4G service on August 29 (along with O2), but the big red is yet to reveal its hand on the LG G2. Over on Carphone Warehouse you can already register your interest in the LG G2, with a tentative release date of "October 2013" listed. No word on the networks the G2 will be offered on, nor the tariffs which will be available, however. Not everyone is loving the LG G2, and high street retailer Phones 4U has confirmed to TechRadar that it "will not be stocking the LG G2." So there. Expansys has the 16GB LG G2 available for pre-order, but there's no guide price or release date listed, so you'll be very much ordering it blind. The 16GB model also appears on Clove, but this time there's the choice of black or white. No pre-order option here though, all you can do is register your interest. Price and release date are also absent for the time being.